While Labor Day weekend typically signals the end of summer, my family thinks of it as the beginning of fall. My annual proclamation is always, Christmas will be here before you know it. When the kids were younger they would just roll their eyes and humor me. But as they have grown and started families of their own, they now realize how quickly these next four months pass. On that happy note… here is my weekly summary. I am still keeping to my original schedule for the Harry Potter read-along. I finished The Sorcerer’s Stone last weekend and immediately started The Chamber of Secrets. I am now about 30% through the second book and enjoying them immensely! Yesterday Belle posted on Facebook that she plans to participate in the RIP X reading challenge. I have such fond memories of this event when I was a more avid book blogger, and I thought it might be nice to participate again… someday. Then I realized Harry Potter would qualify as mystery or dark fantasy, right? With that rationalization I am thrilled to participate after a several year hiatus. I registered for Peril the Second level, which means I plan to complete two books between now and October 31st. Ideally, I would love to add a few more mysteries to the list… but I don’t want to set myself up for failure. So for now I will plan to read the Chamber of Secrets and the Prisoner of Azkaban. If I manage to sneak a cozy mystery, I’ll let you know. It appears my lack of confidence is worse than I realized. Last week I posted my doubts as to which direction I should take my writing. Unbeknownst to me, I apparently suffer from “but” disease… constantly discounting my efforts by using this self-deprecating term. And my writing coach called me out. 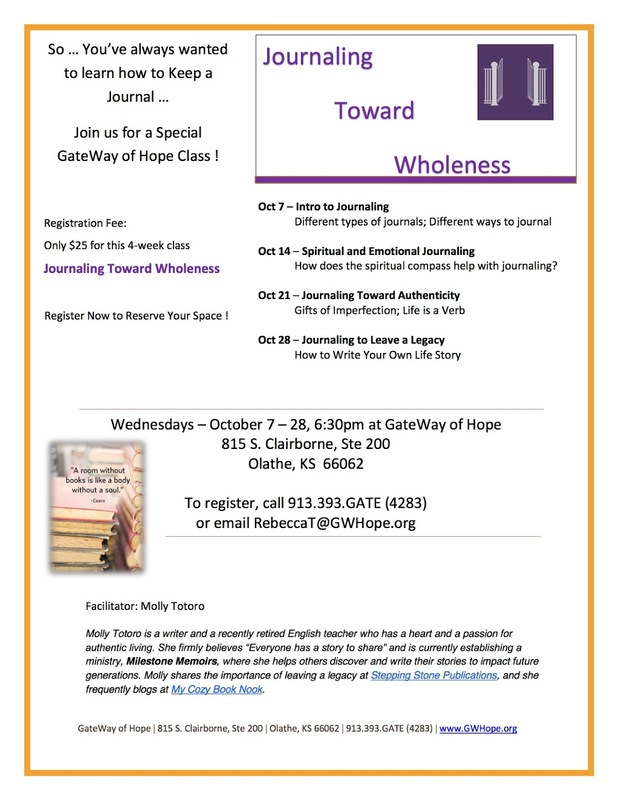 So this week I am trying to focus on “and” … recognizing weaknesses AND strengths in my writing interests. I love to journal and continue to do that on a daily basis. 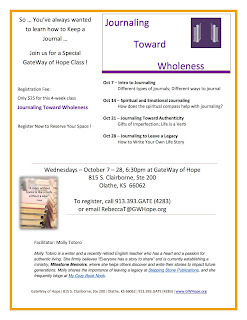 I am excited to start teaching my Journaling towards Wholeness course in October. And I love teaching the Storytelling Workshop. I look forward to inspiring these young writers and encouraging them to follow their dreams. I feel comfortable writing non-fiction and plan to use my research of Impressionist Art to create interactive iBooks. This will be a fun project that might lead to future multi-media ideas. And while I lack the confidence to write middle grade fiction, I do enjoy the academic pursuit. I will continue to flesh out the characters and the conflict. I am still on the writing journey and still learning how to focus on the process rather than the finished product. While I deemed DELIGHT as my word of the year, I often go for weeks without giving it a second thought. I’ve already decided it will by my 2016 word of the year as well. But this week I made a conscientious effort to add more delight to my life. I discovered that delight and fear are closely connected. If I give in to fear, I lack delight. And if I desire delight, I must overcome fear. 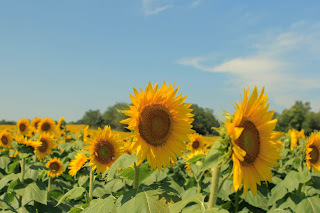 I wanted to visit a sunflower field and play with my camera. A simple concept for most, but for me… fraught with fear. First I must drive to the field. Drive on a toll road (hate the toll booths) to an unfamiliar location (along a gravel road in the middle of nowhere) that is not easily accessed by Google Maps. But I filled the tank with gas, made sure my cell phone was charged, and headed out. Next, I had to overcome “impostor syndrome” I know I am not a professional photographer, but I fear others looking at me with camera in hand and thinking who does she think she is? I imagine their critical comments as I try to find the right angle and the appropriate f-stop. But on Friday afternoon, I threw caution to the wind and ventured out. 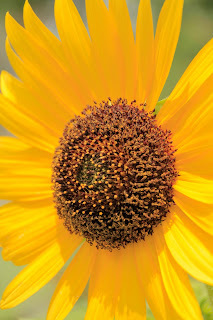 Yes, it was in the middle of the day when the light is most harsh (not ideal photo conditions), but I reasoned the crowds would be few (I was correct) and sunflowers thrive on bright sunshine. I got lost only once, and discovered it was not the end of the world. I actually used my Google maps app and got back on track in no time. 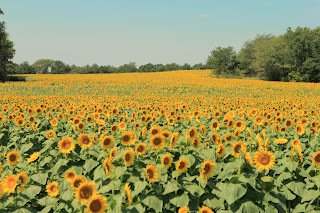 As I rounded the bend toward the field, the view was absolutely spectacular: deep golden yellows and vibrant greens as far as the eye could see. The sky was a bit hazy, but the blue was evident. There was even an occasional wisp of white clouds that added dimension to the landscape. I probably spent about 45 minutes wandering the field, marveling at God’s artistry while at the same time trying to capture the emotion and beauty in still photographs. It was a success in every conceivable way. I hope that you too are enjoying these final days of summer because… Christmas will be here before you know it. Confronting your fear was such an inspiring story. Thank you for sharing it. Hi Molly! I am worried about setting myself up for failure with the RIP challenge too. But then I ask myself: who cares (besides me) if I don't finish all the books I want to finish. So I'm going to try setting my anxiety aside this year and join under the terms "in an ideal world, this is what I'll read." Beautiful flowers! I wirk right next to the MN Aboretum, and I wish I could afford to go more. Flowers are wonderful. I love that attitude, "in an ideal world…" I should adopt that one myself! I look forward to staying in touch through the RIP challenge – it should be a lot of fun. You are much too hard on yourself! I think most people are so engrossed in themselves that they give others very little thought. Keep pushing yourself so you can find the delight in your life! Oops, I think my comment got lost! Trying to remember what I said. I really live that word delight, and the way you saw its relationship to fear. And your pictures are beautiful! Molly, I can relate to your post so much. Good for you for conquering those fears! You inspire me to pick something I’m fearful about and go for it! I know it is easier said than done, Becca… but I hope to do more conquering and less cowering in the future 🙂 At the very least, I'm not going to concern myself with what others may or may not be thinking about me. I can totally relate to your fears. I go through a lot of what you described whenever I set out on some unfamiliar adventure, even if it's just driving across town to try a burger from a vintage burger stand. Your pictures are great! I'm glad you went! Your photos are awesome! You have to just dive right in and accept mistakes and imperfections as chances to learn and grow. Molly! I found you again! I was just thinking about you the other day and wondering if you were still blogging and here you are! I hope life is treating you well and hope to get caught up with you. I detest freeway driving through downtown Seattle (necessary to get to my mom's house) and now I drive the back roads through the city which takes a little longer but less gridlock and places to easily pull over if needed.! And you are reading Harry Potter! I loved those books so, and still miss my friends within those pages. I have been toying with the idea of starting them again. I like what you had to say about delight, and I hadn't really ever thought about it in opposition to fear. I am the same way about driving to unknown locations, or being in the middle of nowhere by myself on someone else's land. Yes, that plays into a lot of fears. I'm glad that you took a chance and got such lovely photos! I am trying to remember that the joy is in the journey, not the final destination. The field was naturally photogenic 🙂 Now to get ready to take fall photos – and then prepare for the holidays! KIM — I have thought of you often, and visited your blog a few times. Your knitting is extraordinary 🙂 I actually started knitting dishcloths last year – just as a way to keep my fingers nimble while watching television. I would never dare try anything as intricate as your creations!